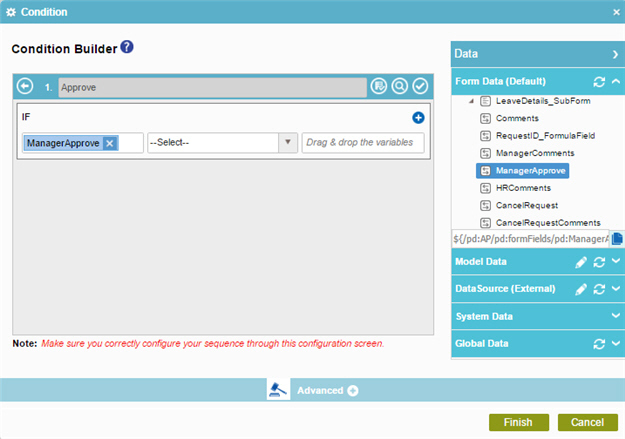 To configure the Approval Status condition activity to check if the manager approved or rejected the leave request in the example absence request process, do the procedure in this topic. 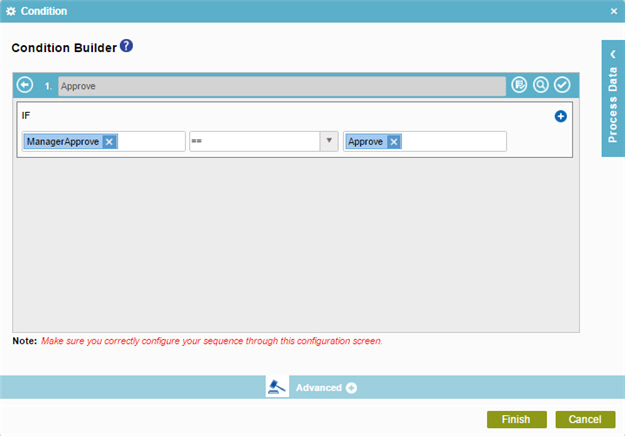 (Example) Configure a Condition Activity to Check the Leave Hours Available in the Absence Request Process. (Example) Create a Manager Approval Task with a Standard Task Activity. (Example) Create a Sequential Approval Task. (Example) Create a Parallel Approval Task. (Example) Configure an E-mail activity to Notify the Requester if the Leave Hours Are Not Available. In the Process Builder, in the Activity Library, open the Common tab. On the Condition Builder screen, in the Display Name field, enter Approval Status. In the IF field, enter Approve as rule name. In the ELSE field, enter Reject. To specify your rule, click Edit . 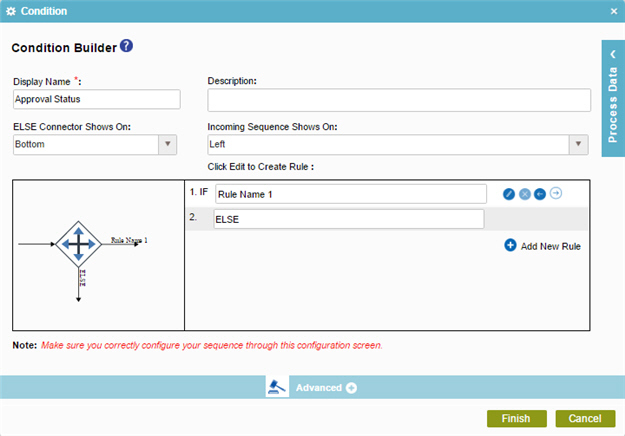 In the Rule Variable field, drag the ManagerApprove process data variable from the Process Data > Form Data screen. In the Operator field, select the expression == from the String data type. In the Rule Value field, enter Approve. Click Back to save your rule and go back to the Condition Builder screen. The Process Builder shows the Approval Status condition activity in the example absence request process.